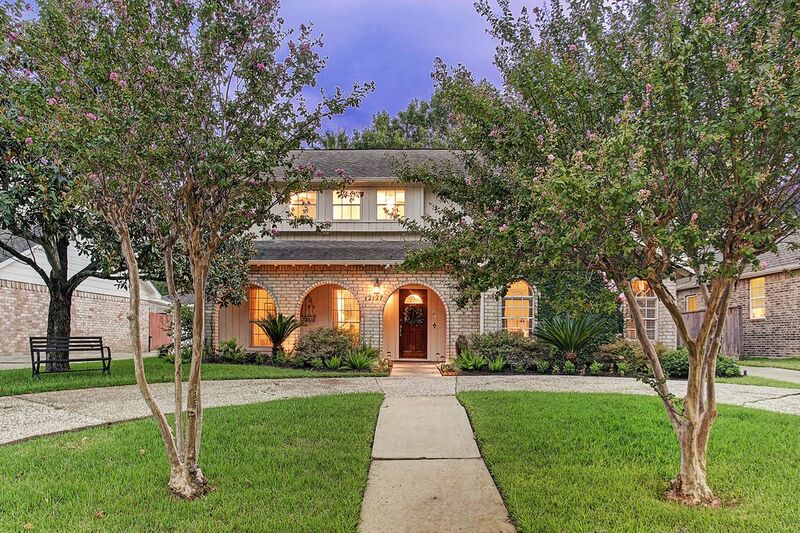 12127 Westmere Drive, Houston, TX 77077 | Martha Turner Sotheby's International Realty, Inc.
A front view of the home with its' pretty landscaped beds and circular driveway welcomes you to your new home! 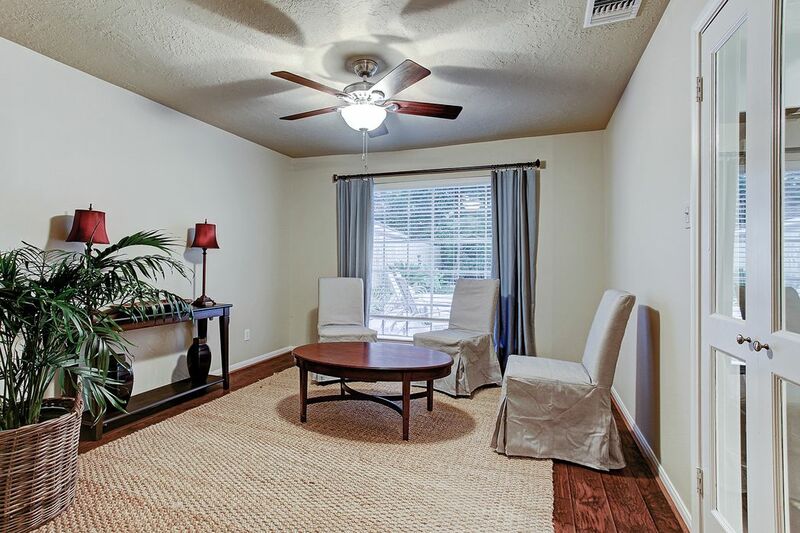 The Living Room has lots of natural light from all of the four windows. The fireplace creates a warm and cozy room in the winter. The Living Room also has a wet bar (at the top of the photo) for entertaining. 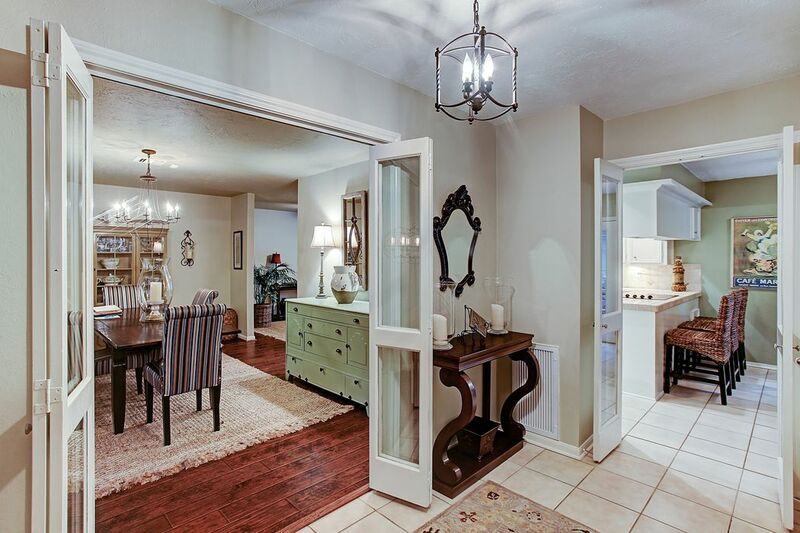 There are bookcases and cabinets on the left and the entry to the breakfast room and kitchen area can be seen. The french doors lead out to the pool and patio area. 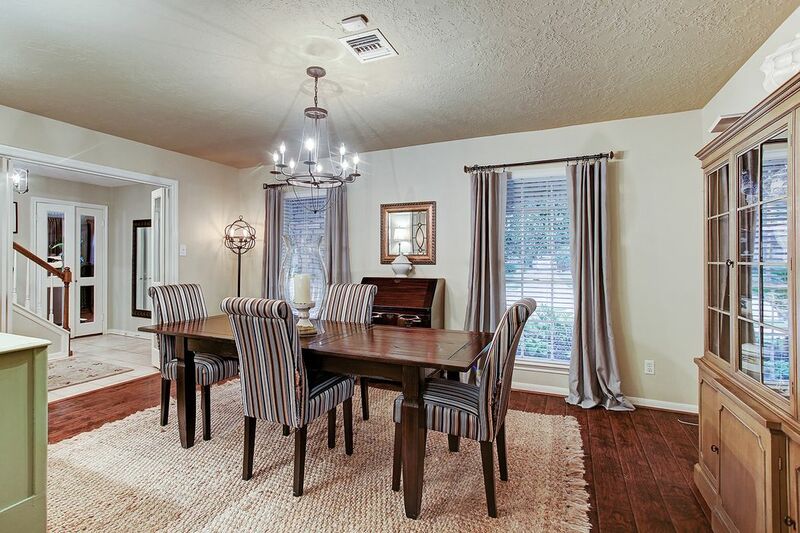 The Dining Room is right off of the front entry hall and has two large windows overlooking the front yard. 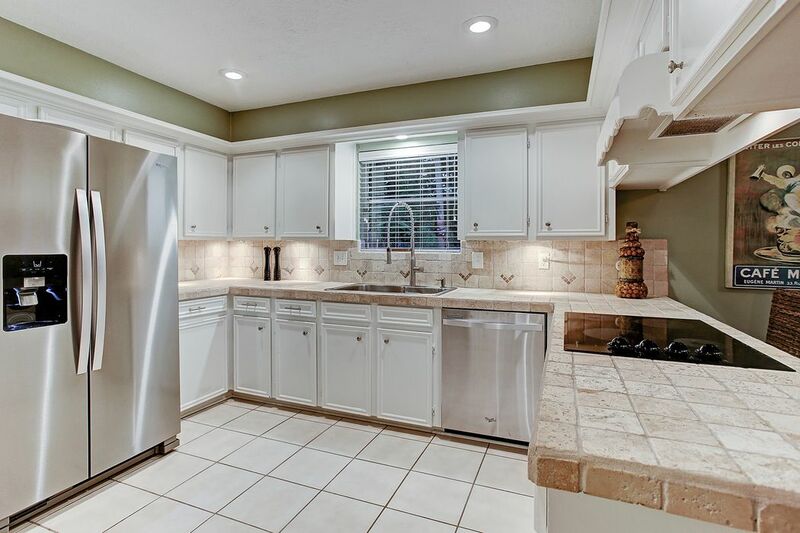 The Kitchen has a brand new stainless refrigerator, stainless dishwasher and new stainless fixture at the sink. Counter top is travertine tile and tile floor. 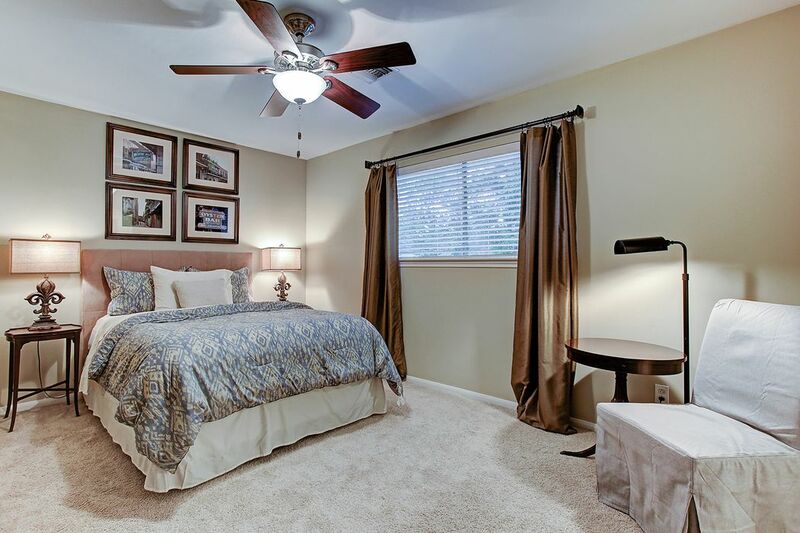 The Master Bedroom is spacious and can easily fit a king size bed, large night stands and other furniture. 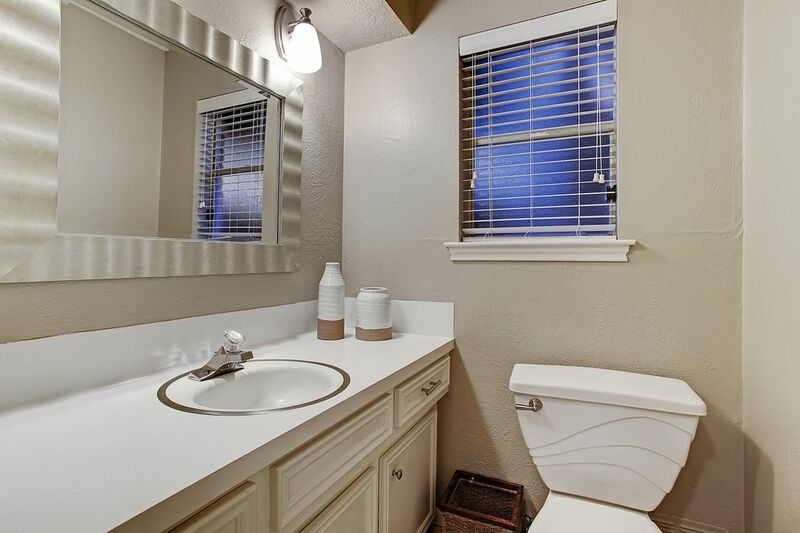 The Master Bath is en-suite. 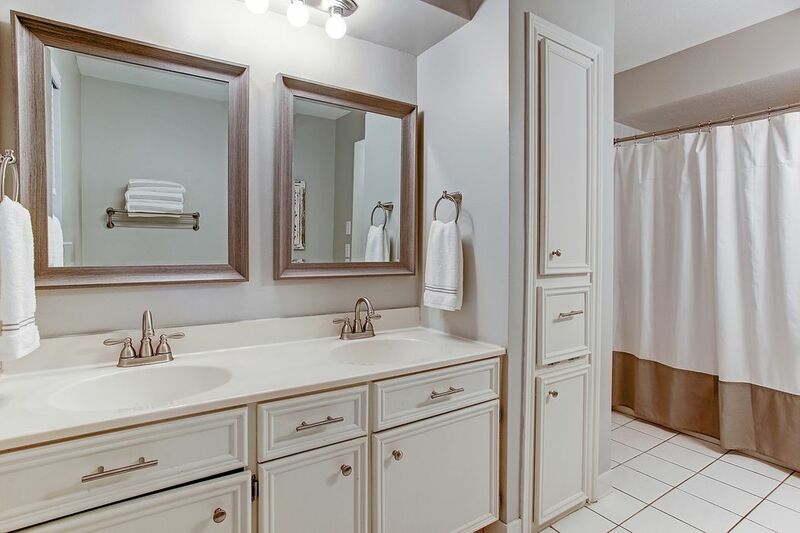 The Master Bath has double sinks with new fixtures and new cabinet hardware, new mirrors above the sinks and a tub/shower to the right. The second bedroom has lots of natural light and has a doorway to the secondary bath, which is shared with the third and fourth bedrooms. 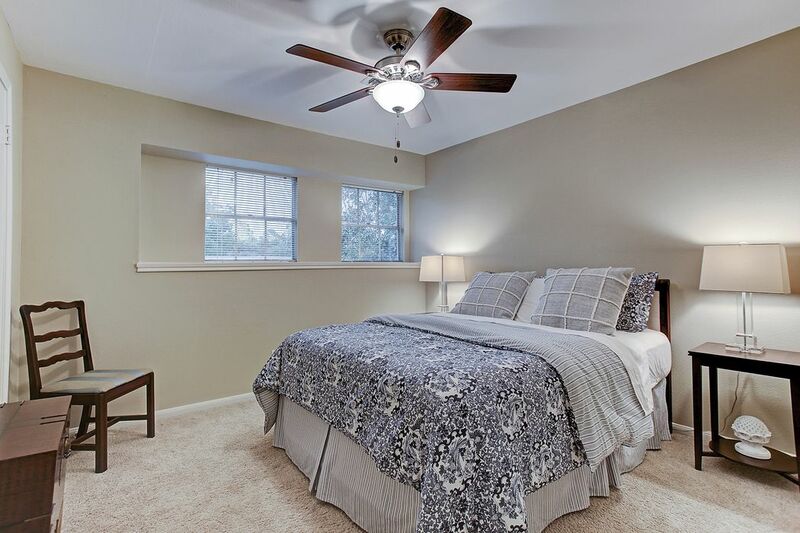 The third bedroom is across the hall from the secondary bath and has two windows overlooking the front lawn. 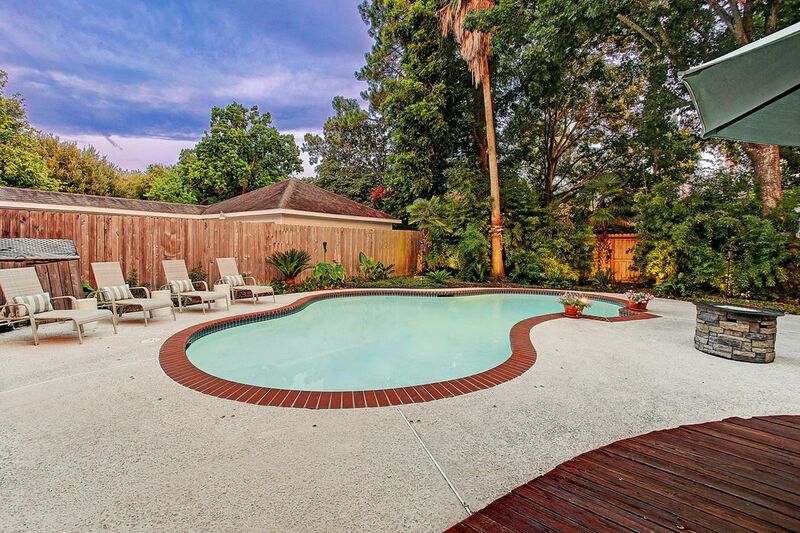 The wonderful pool in the back yard is a quiet and relaxing space with plenty of room for chaise lounges, a fire pit and a table for dining and entertaining on the deck/patio. 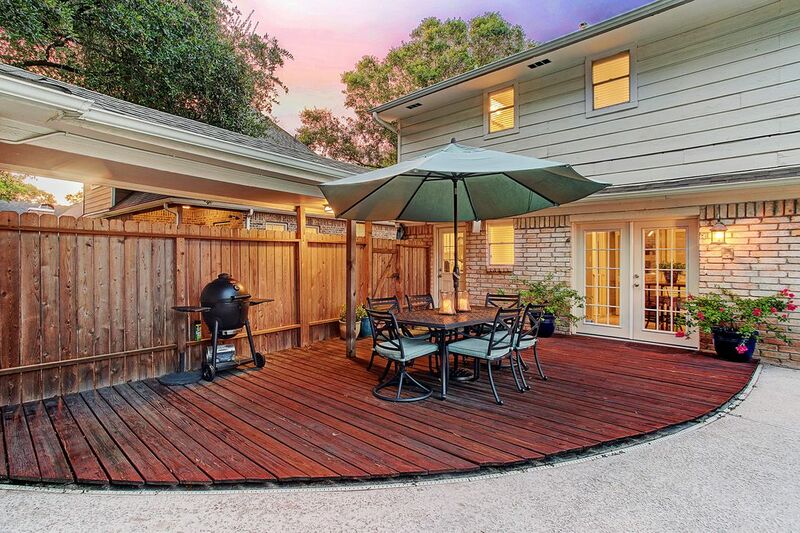 The deck is a great place to entertain family and friends around the pool. As you enter the home, the front entry way opens to the Dining Room on your left and leads to the Kitchen and Breakfast area. 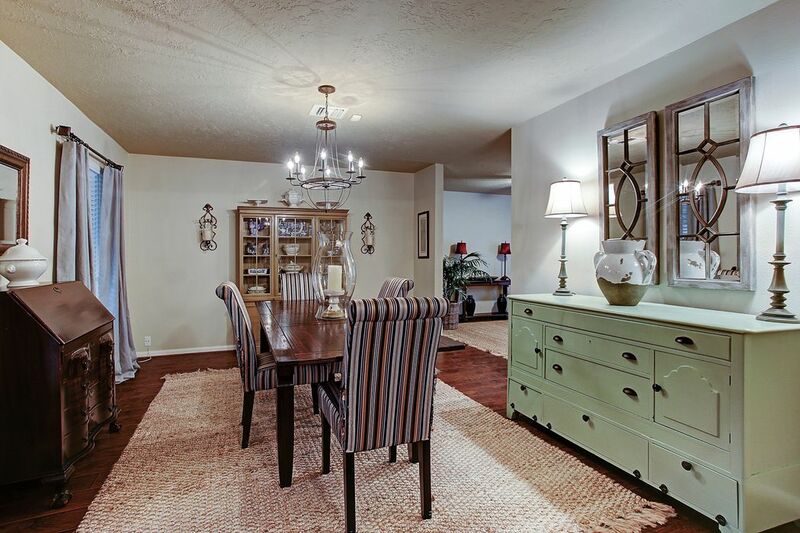 The Dining Room is adjacent to the Den/ extra room. The doorway opens to the Kitchen. 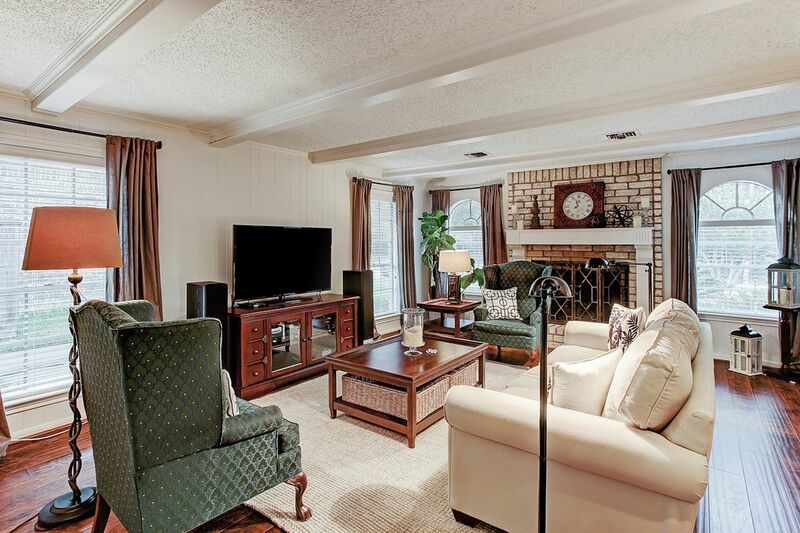 The Living Room is off of the front entry hall to the right. 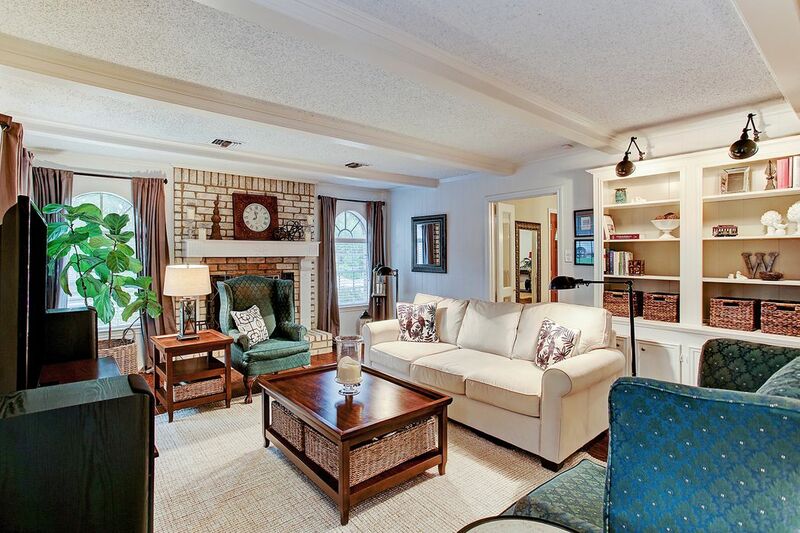 This spacious room has a brick fireplace and bookcases with cabinet storage below. Another view of the Living Room looking into the Breakfast area. The folding doors are concealing a wet bar with cabinets below. 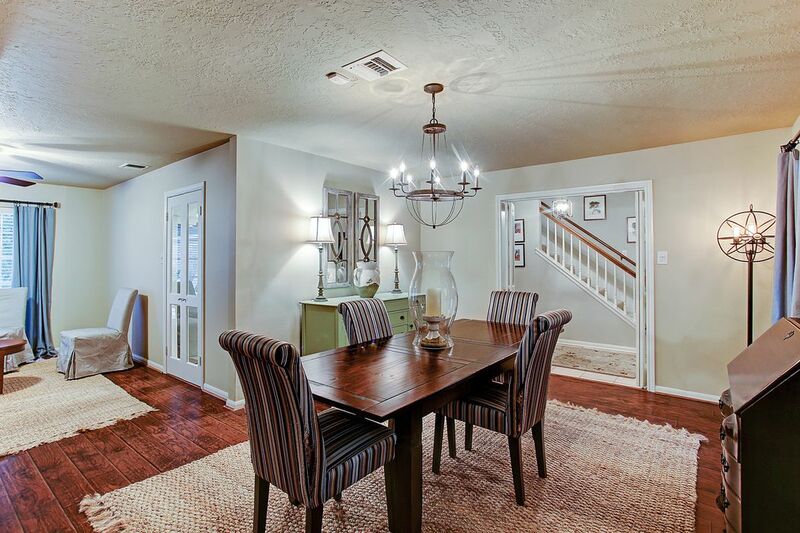 Another view of the Dining Room with the adjoining den area off of the kitchen. This Den is adjacent to the Dining Room and leads to the Kitchen on the right. This room overlooks the pool and back yard area. The Kitchen has lots of cabinets and storage above and below. 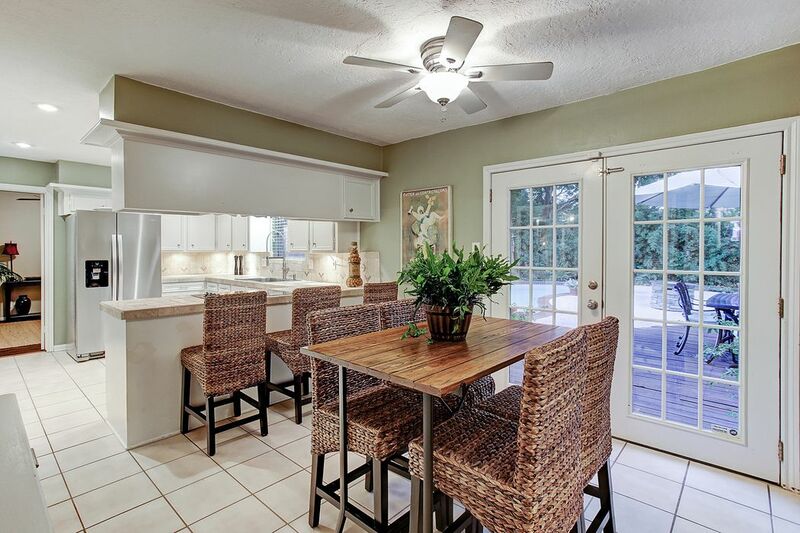 The Breakfast area and french doors leading out to the pool and deck/ patio. The Breakfast area and hallway to the half bath and laundry room. 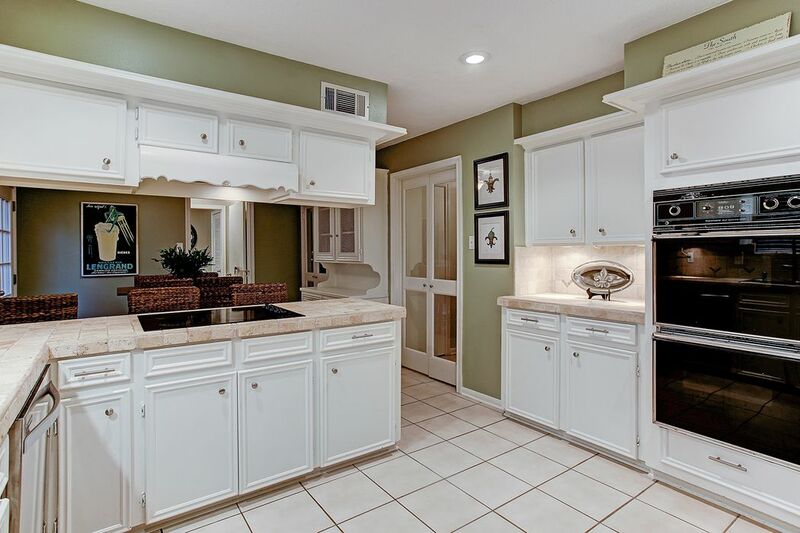 Note the built-in hutch on the right with extra storage cabinets above and below. 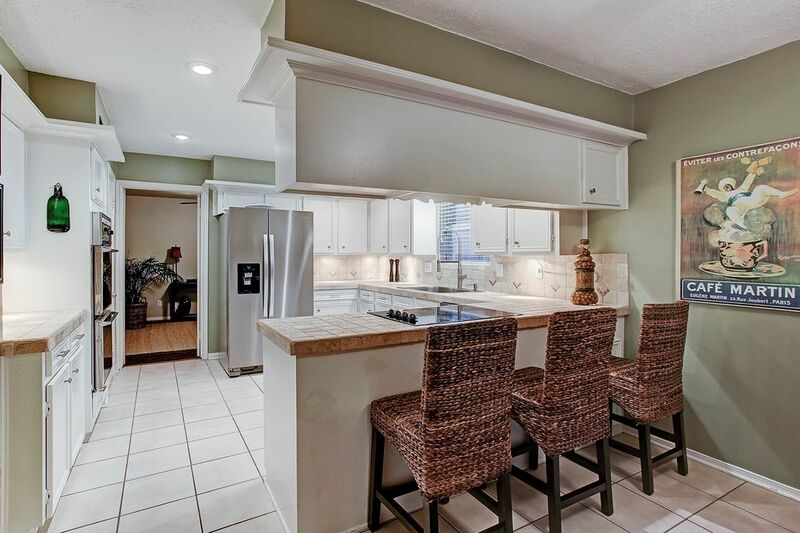 The kitchen has counter seating space for entertaining and dining. 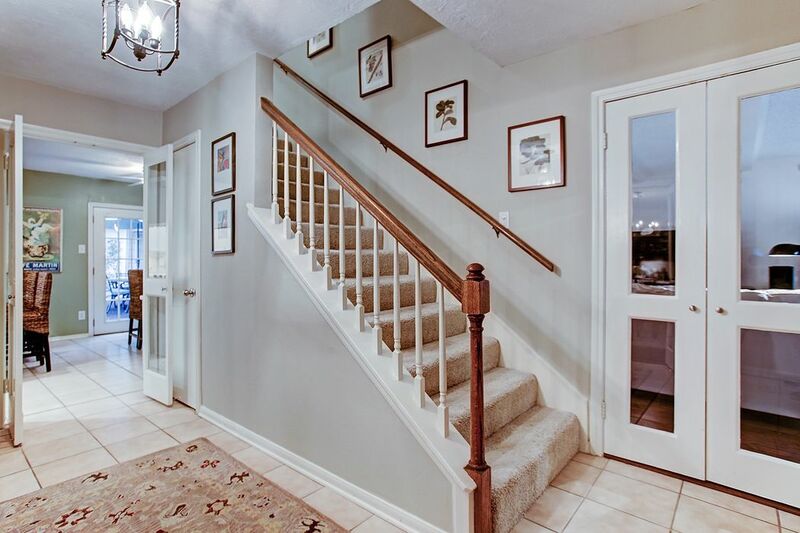 The stairs on the front hallway up to the four bedrooms and two full baths. Doors on the right are to the Living Room. Upstairs second bath has double sinks with a large vanity area, travertine counter top, large tile shower and tile floor. Half bath/ powder room on the first floor rear hallway, which is off of the breakfast room and adjacent to the laundry room. 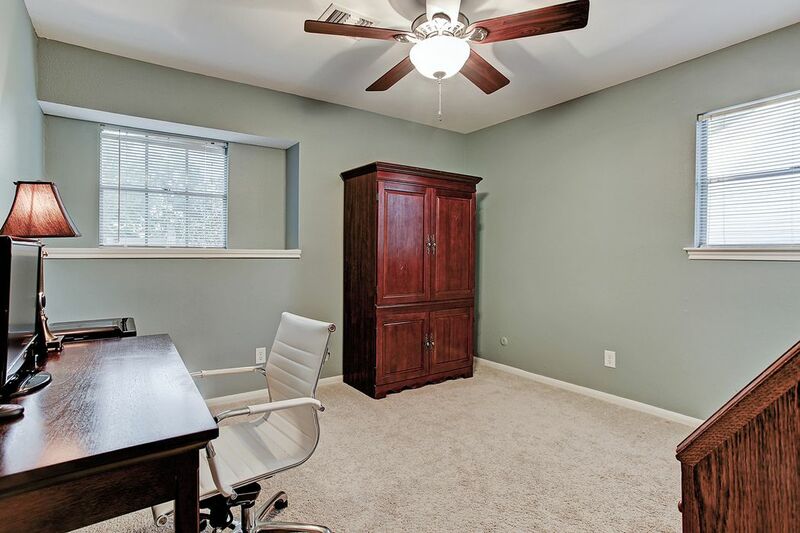 The fourth bedroom can also function as an office or workout room. 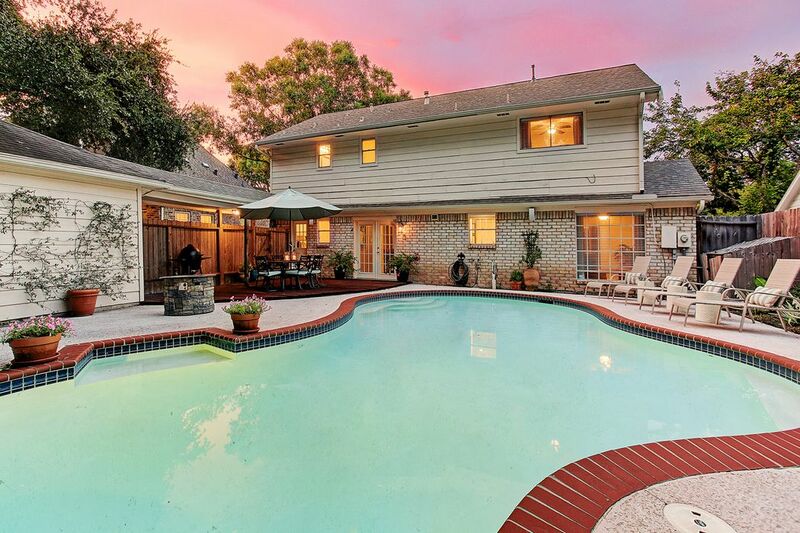 The pool and patio area is surrounded by tropical plants and trees creating a vacation back drop that will make you never want to leave home. 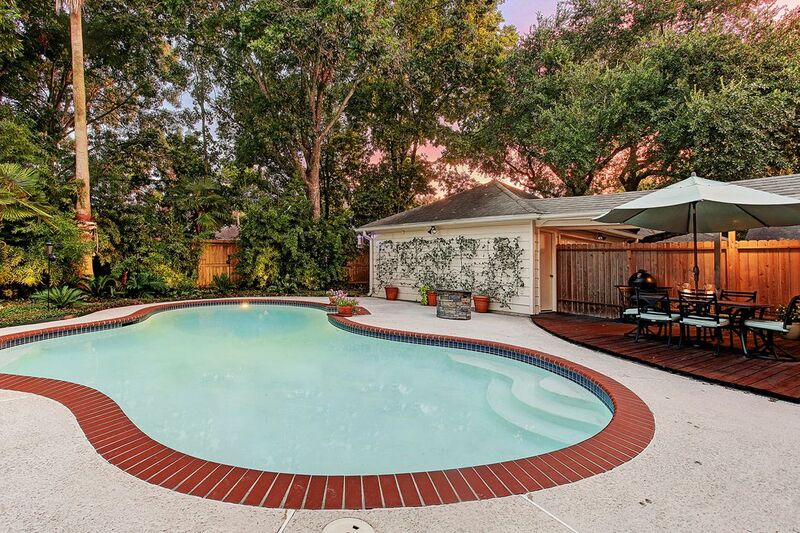 A view of the pool with the handsome red brick coping surrounding the exterior. 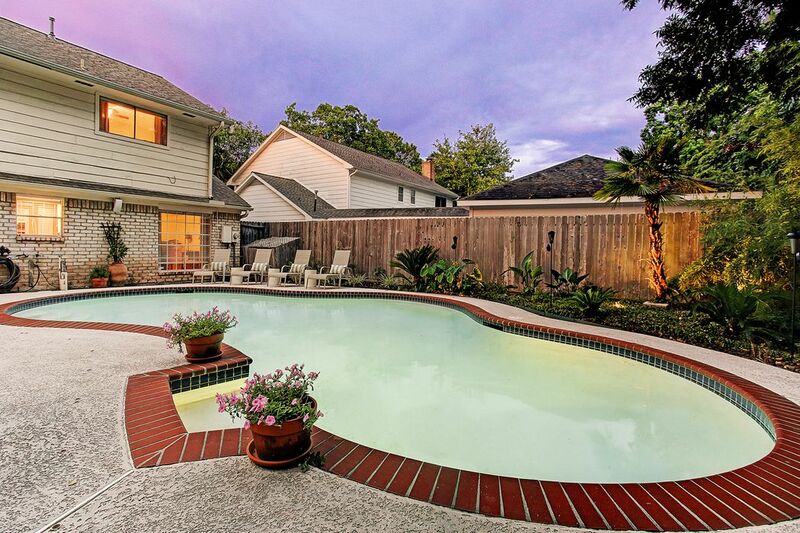 Another view of the pool, back yard and deck area. 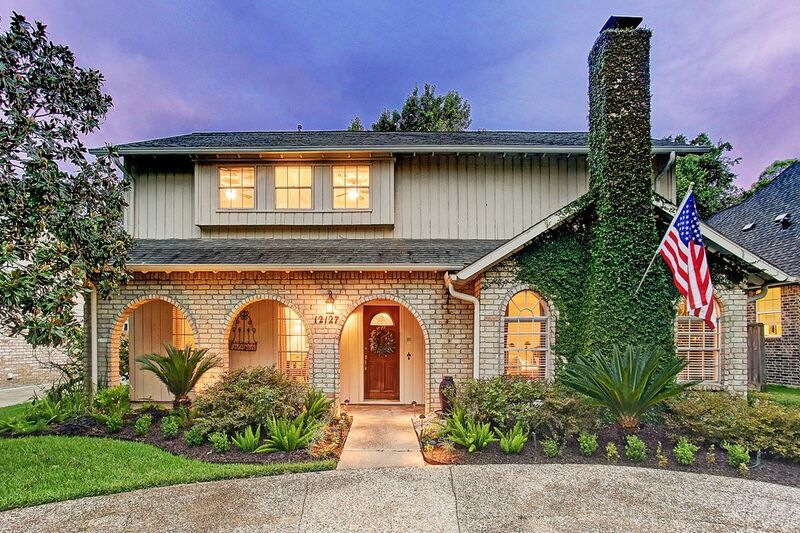 The porch area and landscaping create a welcoming front entrance to this comfortable home. 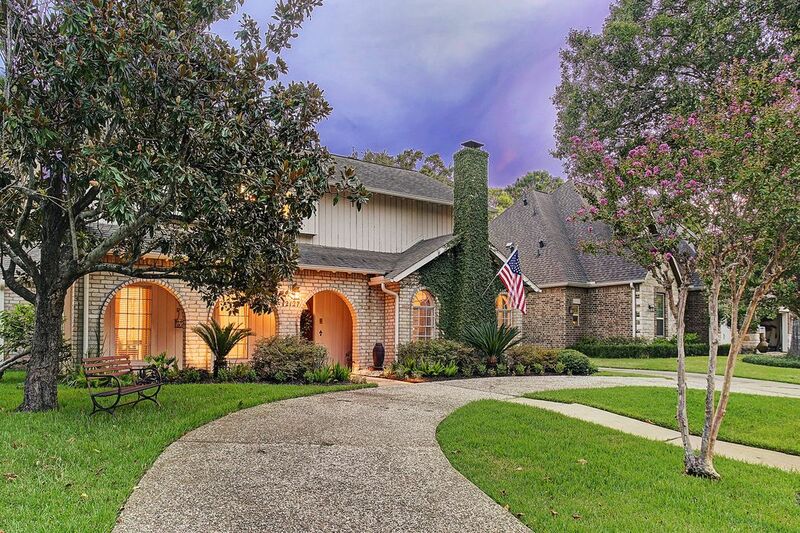 The front yard and lawn of the home has mature trees and landscaping surrounding the circular driveway. 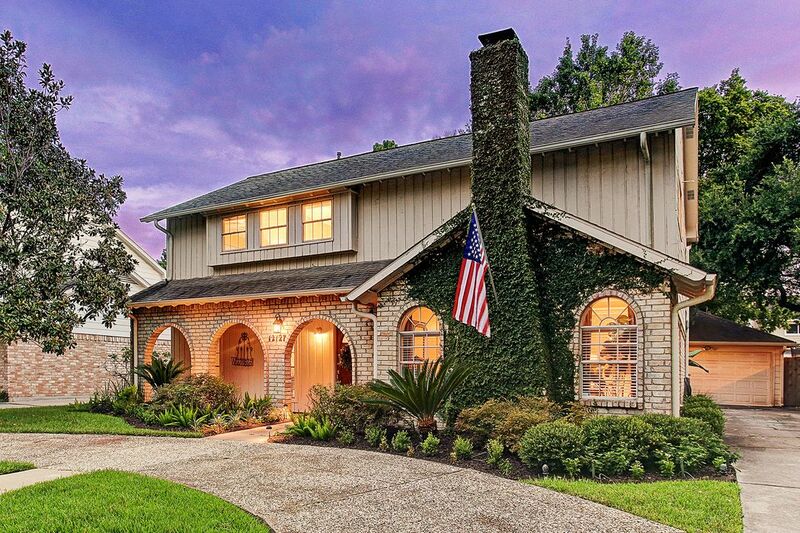 This two story home has plenty of parking for a family and guests. The two car garage is on the West side of the home and is adjacent to the pool and patio area. A view of the home with the circular driveway and sidewalk leading out to the street. 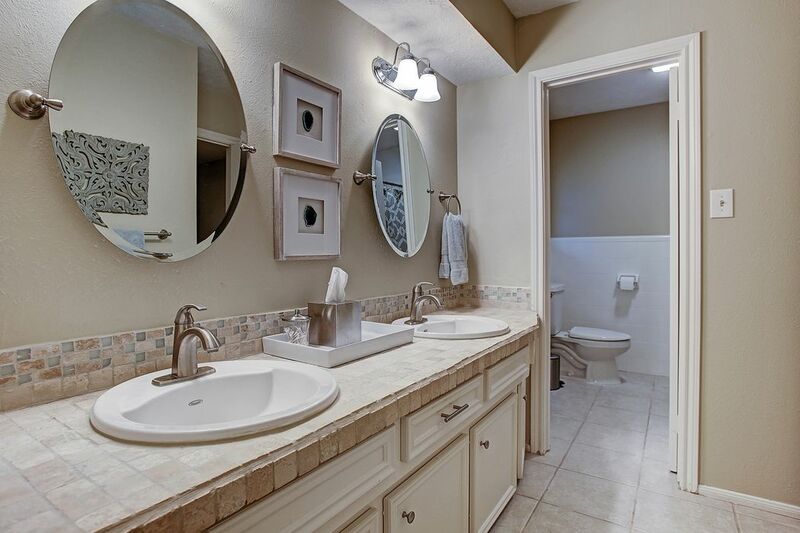 $329,900 4 Bedrooms2 Full / 1 Partial Baths2,547 sq. 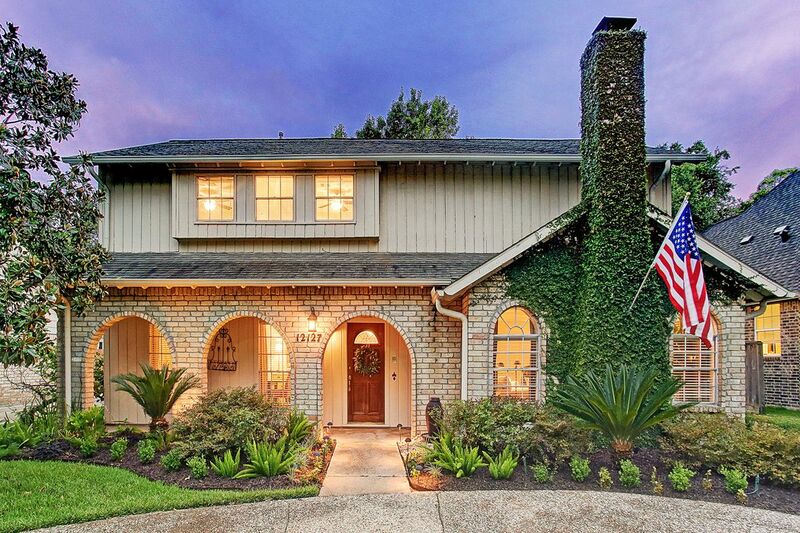 ft.
Charming home in Briar Lake has great curb appeal. 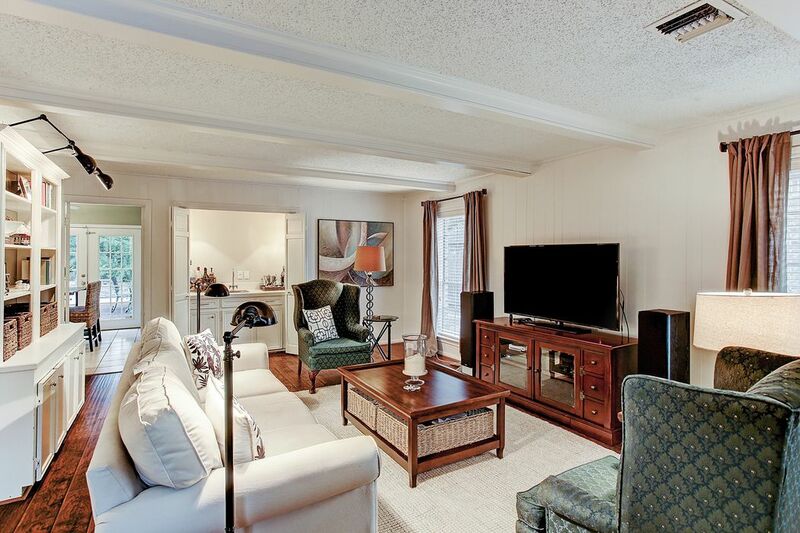 The spacious living room with wet bar opens to the breakfast area and kitchen, complete with all appliances. 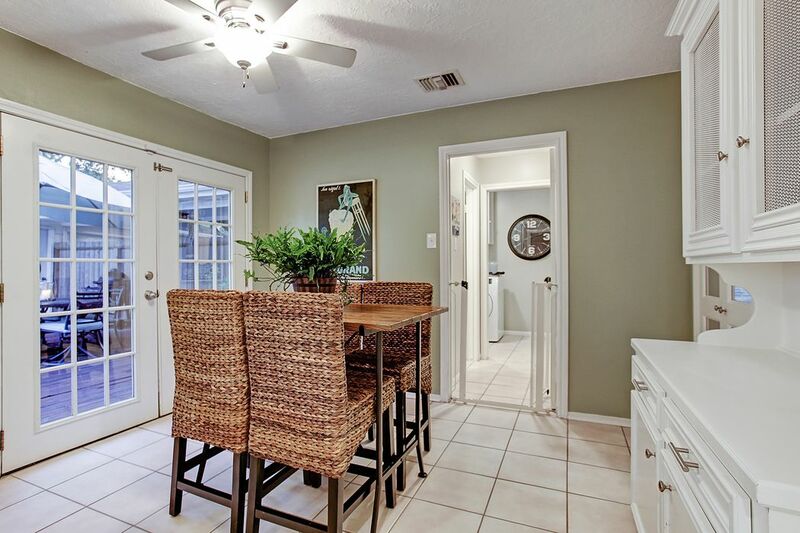 There is a small den off of the kitchen which allows for additional entertaining space leading to the front dining room. Beautiful pool and backyard deck area. 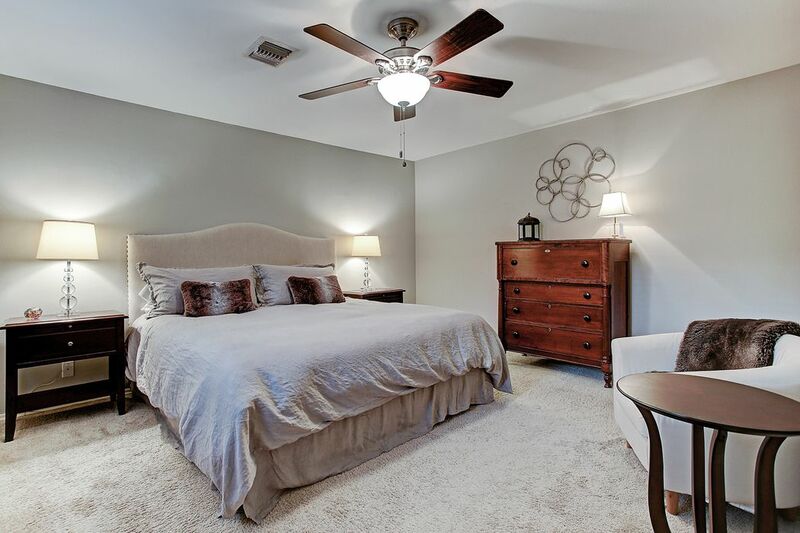 There are 4 bedrooms upstairs, a first-floor laundry room including washer and dryer and a 2-car garage. No flooding during Harvey.